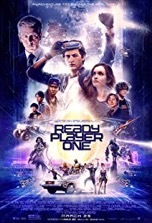 A young man attempts to win fame, fortune and the affections of a young woman by solving the mysteries of a virtual reality game. Directing- After a string of historical dramas—War Horse (2011), Lincoln (2012), Bridge of Spies (2015) and The Post (2017) (with 2016’s kiddie pic The BFG thrown into the mix)—Spielberg has returned to his action/adventure roots. But has he matured beyond this type of film? No one can fault his craftsmanship here, but the movie just seems incongruous with his recent works and is completely beneath him. Still, RPO must’ve been a nostalgic trip for the director since it contains many references to his early life and career. Acting- Sheridan is decent as the hero, but it’s Cooke who shines as the worldly-wise, no-nonsense sidekick. Mendelsohn, who was serviceable as the villain (Krennic) in Rogue One, is utterly laughable here as a greedy, selfish tycoon who pays his employees to find the three keys just like Mr. Salt (Roy Kinnear) pays his factory workers to unwrap chocolate bars to obtain a Golden Ticket for his daughter in Wonka. Rylance, Spielberg’s touchstone of late, is the backbone of the story and conveys the only genuine emotions in the film as the lovelorn programmer who just wants to go back to when games were fun…before designers ruined them by making the graphics so realistic that nothing was left to the imagination. Simon Pegg underwhelms in a role that neither suits his energetic personality nor his comedic sensibilities. Maybe he accepted the part just to work with Spielberg. Story- The story by Zak Penn and Cline is a mixed bag. The way they introduce the OASIS is extremely odd—it’s like a documentary/infomercial about the history and conventions of the VR world. The intro contains way too much preamble…we just want to watch the movie/play the game. Plus, the writers need to show us, not tell us what’s going on in these scenes. Case in point, instead of mentioning the option to climb Mt. Everest with Batman, the writers’ should’ve incorporated that plot possibility into the story (and if licensing was an issue, they should’ve selected a different hero). These amazing concepts feel like secondhand descriptions rather than firsthand experiences. RPO’s expositional opening is like playing the demo of a video game and getting enough of a feel for it that you get bored at the thought of playing the actual game. Some of the challenges are far too easy for the characters to solve and many of the clues are telegraphed (like the ones obtained while watching just the right moment of Halliday’s expansive video library). In short, the writers try to cram too many characters and too many action sequences into a story that’s overstuffed with iconography, styles and themes from the pop culture grist of a bygone era. Costumes/Make-up- Though diverse and colorful, many of the stylish outfits seen inside the OASIS are rendered on a computer, which means they qualify more as FX than physical costumes. The VR bodysuit is an impressive creation and is destined to be a household item in the future. Cinematography- Janusz Kaminski (Saving Private Ryan) is as masterful as ever. However, since the majority of the film is composed of CGI characters and environments, the visuals grow tiresome after a while (like watching a feature-length podrace). The epic battles are well staged and filmed, but come off looking like a LOTR-style fracas with cosplayers subbed in for orcs and trolls. Music- Alan Silvestri’s score is full of energy and whimsy and hearkens back to his work on the Back to the Future movies. Visual FX- Mind-blowing CGI that, unfortunately, equates to empty calories for the brain…like many video games. The OASIS is pure artifice. The CG never slows down long enough for your eyes to assimilate the many details inside the VR world. Is that because the CG artists cut corners? Though they serve as the actual star of the movie, the FX aren’t nearly as impressive as those seen in last year’s Valerian—another action-packed, teeny sci-fi adventure. Production Values- Unquestionably a top-dollar production. The film attempts to create a cinematic video game experience. It achieves just that…for better or worse. Movie Magic- Totally subjective. Teens may like the action and video game aspects and adults may like all the references to 80s pop culture. Many people will dislike the movie for either or both of those reasons.